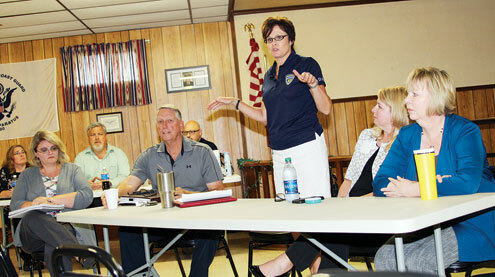 A critical staffing shortage and rate of pay were among the most discussed issues during two meetings held by Missouri Department of Corrections Director Anne L. Precythe and other officials on Friday, Aug. 31 for staff at Northeast Correctional Center (NECC). NECC employees were invited to share their concerns with state officials which included Director of Adult Institutions Alana Boyles, Deputy Division Director Cindy Griffith and State Rep. Jim Hansen. NECC Warden Chantay Godert and her administrative staff were also on hand at the meetings to hear from staff members. The meetings were held at the Bowling Green VFW Hall. There were about 15 staff members at the first meeting that lasted just over two hours and about 35 employees at the second meeting that lasted over three and a half hours. It was pointed out at both meetings that staffing is at a critical shortage and that veteran staff members are leaving the institution for other employment at an alarming rate. One officer pointed out that conditions are becoming unsafe and that steps need to be taken immediately to rectify the situation. It was also pointed out that DOC employees in Missouri are among the lowest-paid in the nation which is lending to the retention problem. Precythe asked employees at the meetings to be open to hearing what state and local officials had to say and added that these types of meetings will be held in the future to keep the lines of communication open. She added that she has directed Godert to begin holding meetings of a similar style for staff to ensure administrators are aware of issues within the institution. “We’ve certainly made strides in what we’re doing,” Precythe noted of the work that’s been done since she was appointed to the post. She outlined that some issues have been addressed such as promotion standards, hiring processes, harassment, education and training. Precythe further explained that meetings with the governor are ongoing and that he has asked for options on how to increase pay state-wide. She noted that pay increases are the number one push they will make this legislative session. She further noted that plans are being developed to address pay grades so that a person in a position with 10 years of experience is not making the same amount as someone brand new to the same type of position. One officer at the first meeting noted that staff are severly overworked due to mandatory overtime and they sometimes feel unsafe. He pointed out that a bandage will not be enough and that immediate action is needed to fill positions. Boyles explained the department is aggressively recruiting using new methods such as social media and other web-based platforms, along with recruitment efforts at the high school level. Precythe stressed the need for current staff members not to complain about their jobs online, which hinders recruiting. Another officer pointed out that on-the-job training is lacking due to the shortage of veteran staff members. Precythe mentioned the possibility of temporarily transferring seasoned staff from other institutions to NECC until positions are filled permanently. She urged employees to be welcoming of new staff members and to help train newcomers. She stressed the need for departments to work together for the greater good. Godert pointed out there is slated to be an addition of over 30 employees to the staff over the next month. “It’s going to take all of us to get over this hurdle,” Godert remarked. NECC currently has a 100 in 100 plan that calls for 100 new employees in 100 days. A caseworker in one of the housing units at NECC noted there is an ongoing communication problem at the institution. She noted that it’s difficult for staff to feel valued when they say the same things over and over and the concerns don’t seem to be addressed. Precythe urged employees to keep the lines of communication open and to be proactive if they see a potential solution to a problem. She asked that employees trust that she and her staff are working towards solutions. Rep. Hansen noted that he plans to work very hard on DOC issues with the remaining two years he’s in office. He encouraged staff to continue to contact him when they have questions or concerns. He further pointed out that many problems with the DOC go back numerous years and have required a great deal of work to find solutions.